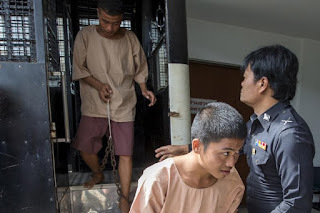 CHIANG MAI, Thailand — Thailand’s Supreme Court has approved Thai prosecution lawyers’ request to extend their counter appeal deadline by one month in the case of two Burmese migrants who were sentenced to death for the murder of two British backpackers. The defense team—made up of members of the Lawyers Council of Thailand, legal advisers from the Myanmar government, and members of non-governmental organizations advocating for labor rights—submitted a 319-page appeal to Thailand’s Supreme Court in August. Since then, Thai prosecution lawyers have asked four separate times to postpone the deadline for them to counter the appeal. The prosecution team is set to submit their argument against the appeal on Jan. 23, said defense lawyer U Aung Myo Thant. “They are not yet ready to make the final plea, and therefore set the date for the 23rd of next month,” he told The Irrawaddy. Win Zaw Htun and Zaw Lin—both in their early 20s—were sentenced by the Koh Samui Township Court in December 2015 for charges they have denied, involving the September 2014 deaths of British nationals Hannah Witheridge, 23, and David Miller, 24, on Koh Tao island. The Thai police’s investigation of the murder has raised questions over the integrity of the prosecution as police failed to test Witheridge’s clothing and were unable to find any DNA, apart from that of the victims, on the alleged murder weapon, a blood-stained hoe. “The two were in good health except that Zaw Lin had a toothache when I visited them some time ago,” said U Aung Myo Thant.